(sample page) - A nice simple well-thought-out bi-lingual dictionary to help children build their language and literacy skills. 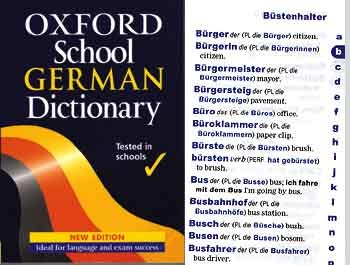 This is an easy-to-use dictionary that we recommend for children aged 7-11 just starting to learn German. - simple grammar info without confusing abbreviations. There is also a useful section on German life and culture. NEW!!! German songs - specially for the primary classroom! 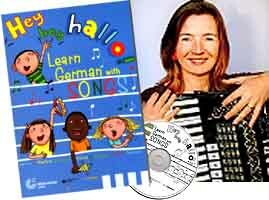 'Learn more German with Songs' is a new songbook and CD, written by songwriter Martina Schwarz and published by the Goethe-Institut London - despite the title, it's specially designed for children aged 5 to 11. The book and CD feature 14 songs with instrumental versions, notated melody lines, guitar chords and lyrics. 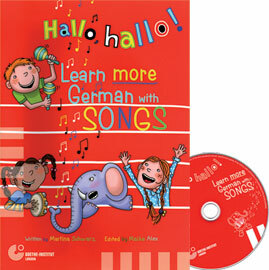 The songs provide a wealth of possibilities for use in German lessons for key stages 1 and 2. Singer-song-writer Martina Schwarz performs on this CD, produced by the Goethe-Institut London. Songwriter Martina Schwarz (pictured) also sings 23 songs on a slightly more advanced audio CD, "Learn German with Songs". This is suitable for KS3 and years 5-6 who are not just starting German. The Songbook has all the lyrics, plus worksheets you can photocopy, and tips for how to use this resource in the classroom. the enchanting colour illustrations by very talented illustrators. They are ideal for reading aloud, and provide a rich "mine" of language to talk about. makes them perfect for young language learners taking their first steps in reading German. It's Saturday and Puppy wants to play. He tries his farmyard friends but they all have something more important to do. Will he have to play alone, or can he find a friend after all? Michael's party is in full swing when - oops, away fly all the colourful balloons! Is the party spoilt or will Mum come to the rescue?